1. Paint your plant pot with black, Deco Art Chalk Paint, allow to dry. 2. Die cut the triangle design die from the First Edition Backgrounds die set, on to a piece of Dovecraft foam. You may need to use your pokey tool to push out the excess triangles. 3. Take a scrap piece of Dovecraft felt, place on the Dovecraft copper ink pad and use to apply the ink to the pot whilst holding the foam on the pot. 4. Repeat this until the entire pot is covered and leave to dry. What a cute way of personalising a little plant pot for your home? You could also bring character to a tag by die cutting the background die onto card, add embossing powder and adhere to your finished tag design. Or you can use the fall out from the die cut to create a cool shaker card. Crafters never like to see a missed crafting opportunity! How will you use this cool 1 die 3 ways article? 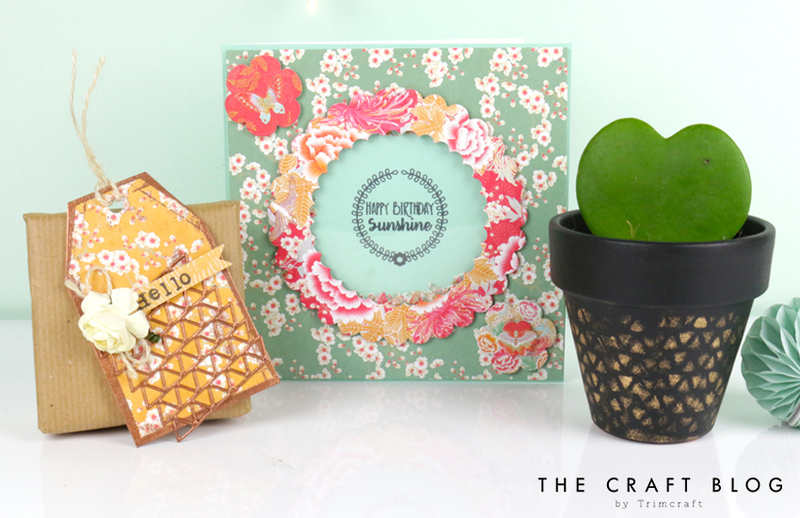 We’d love to see so don’t forget to #Trimcraft when uploading to social media and to share your die cutting crafts in the Inspiration area!